The little tricycle, which was once colored bright red, belonged to a three-year-old boy named Shinichi Tetsutani. Shin had two sisters, Michiko and Yoko, and his best friend was Kimi, the girl who lived next door. Everyday Shin and Kimi played together and looked at picture books, especially the one that had a picture of a tricycle that Shin wanted. He pleaded with his father to buy him one, but there was not a single tricycle anywhere in town. Japan was at war with the Americans and the British, and as the war dragged on it seriously depleted the resources of the countries. When Japan ran out of metal to make tanks and ammunition, it tore down public statues and railings, and took away people’s bicycles and even pots and pans, and melted them to make new weapons. No matter how much Shin cried or sulked, there was nothing his father could do. Then one day, a few weeks before Shin’s fourth birthday, Shin’s uncle arrived with a present for his nephew. To Shin’s surprise and delight, it was a tricycle. Shin’s uncle, who was in the Navy, had found it hidden and forgotten behind his closet. Knowing Shin was asking for a tricycle, he wrapped it in paper and presented it to Shin. 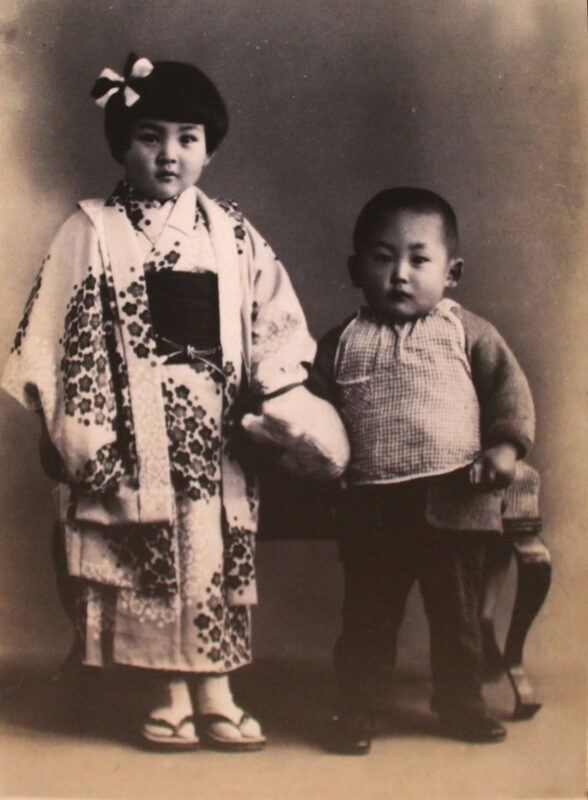 Shinichi Tetsutani with his elder sister. Shin and Kimi often rode the tricycle around the yard, running, laughing, and giggling. Passersby commented how beautiful and cheerful the children looked. That day—August 6, 1945—Shin and Kimi were playing and riding the tricycle as usual, when a terrible explosion ripped through the morning sky. Shin’s family house collapsed pinning down the children, including his two elder sisters, Michiko and Yoko. Shin was rescued from under the rubble. His face was bleeding and swollen, but his hand still held the red handlebar grip from his tricycle. Kimi was nowhere to be found. Shin’s parents located their two other children pinned under a wooden beam, but before the girls could be rescued, the beam burst into flames. Shin’s family joined the other survivors at the river bank. In a faint voice, Shin pleaded for water but his father noticed that people were dying all around after drinking water from the river, so he dared not give him any. Shin did not survive that night. He was ten days short of his fourth birthday. The next day, Shin’s father buried him in the backyard along with his friend Kimi and his beloved tricycle. 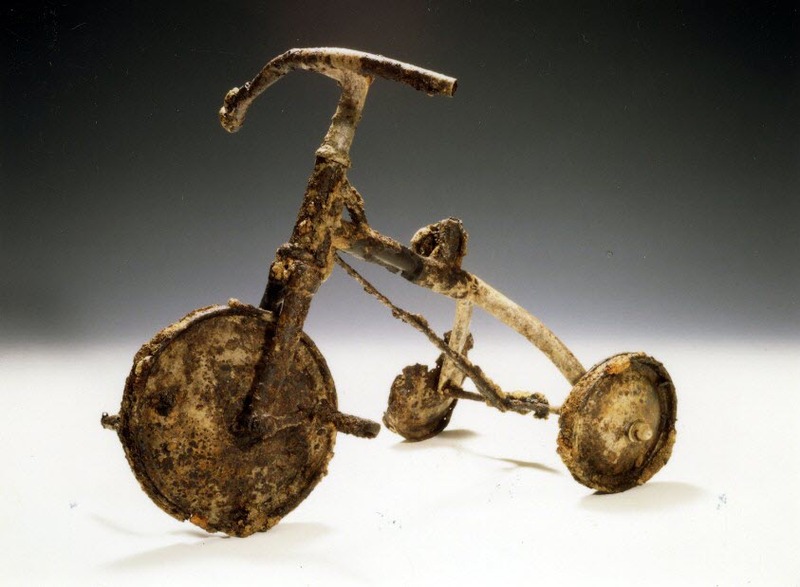 The very next day, Shin’s father donated the tricycle to the Peace Museum in Hiroshima where it remains as a powerful symbol and a bitter reminder of the horrors of nuclear warfare. Shin’s story was brought to light through a children’s book titled Shin's Tricycle by Tatsuharu Kodama published in 1992. While doing so Kodama may have embellished some of the elements for melodrama, but the core of the story—as verified by this page from the Hiroshima Peace Memorial Museum—is true. You can read the entire story (it’s a short one), here.